1Law4All was contacted by News Hub this weekend. Click here to read the article from News Hub and then the link at the bottom to watch the video. The late British author, Donald (Dresden) James, wrote this: “When a well-packaged web of lies has been sold gradually to the masses over generations, the truth will seem utterly preposterous and its speaker a raving lunatic.” Take heart, Don Brash. 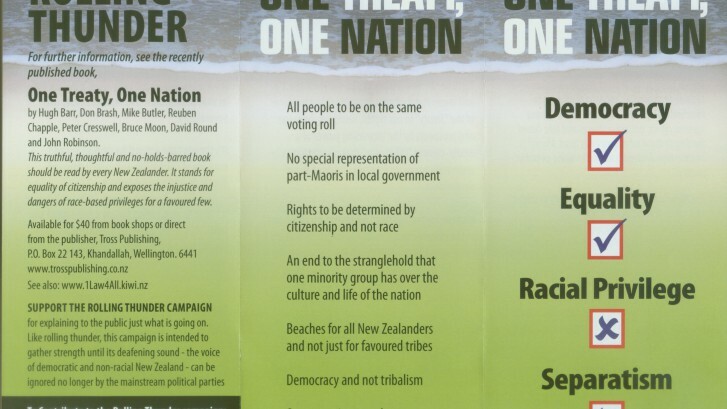 I thought the item on TV3 about the 1Law4All pamphlet was just incredible! So much bias! So incredulous were they that anyone could differ from the propaganda line pushed for so long that they went to Willie Jackson – almost the ultimate in racists – for comment. I was so gobsmacked by the whole thing that I retuned an hour later and watched it again. Makes you realise all over again just how diseased our news media is in this country. When a race has become used to race based privilege, equality seems like discrimination. The great brainwashing experiment, that we in NZ bizarrely call the “Education System”, has been successful beyond part-Maori dreams. A fabulous effort to inform the masses who have for so long now inadvertently failed to pay attention. I imagine many will be shocked to learn the truth. It beggars belief that anything wanting unity and an end to privilege based on race could be labelled as racist. It’s as if they have no idea what ‘racist’ really means. I utterly support an end to all racial divisions and special treatment based on race and want the country to progress as one people – like the original Treaty intended. Nothing could be less racist. It’s our White leaders who are keeping this racist stuff going. The public have been sucked into it. I only hope people will try to learn the truth and read Twisting the Treaty etc. People have been indoctrinated for so long through the education sector that they believe the tripe that has been told to them. It’s true . . . we should be “one people”.